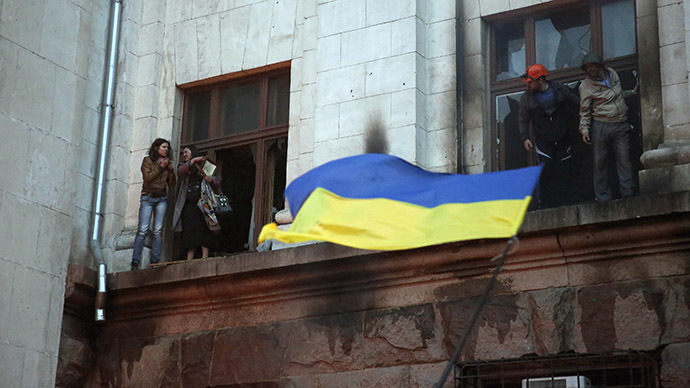 Victims of the Odessa fire massacre died within seconds, but not from smoke or carbon monoxide suffocation, the head of Odessa's emergency service department, Vladimir Bodelan, said on his Facebook page. Violent clashes erupted on May 2 between rival rallies of anti-government protesters and radicals supporting the coup-imposed authorities in Kiev. 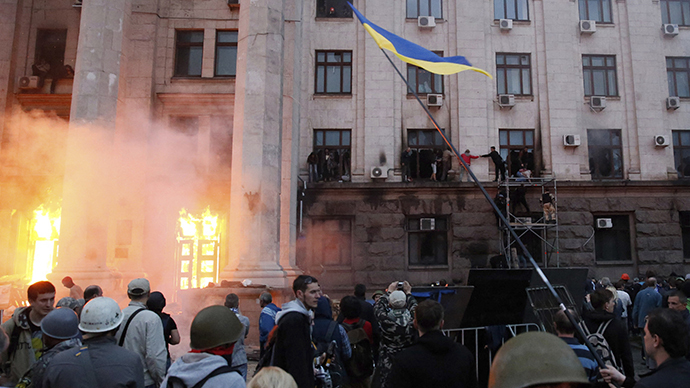 The confrontation led to a tragedy that left 48 people dead and 247 injured as nationalists burnt the protester camp and then set fire to the Trade Unions House with anti-Kiev activists trapped inside. 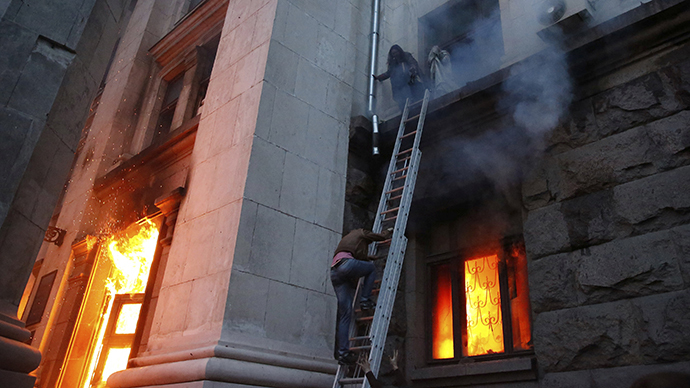 According to witnesses, many of those who managed to escape the flames were then strangled or beaten with bats by radicals. "I'm sure that 99.9 percent of the people were killed in the Trade Unions House within seconds and did not suffocate from smoke...[or burn in the] fire. But there are forensic experts, we will wait for their findings," Bodelan said. He witnessed rescuers carrying more than 350 individuals out of the building while others who managed to jump out of the windows were heavily beaten by radicals – which led to many choosing to stay inside the building. Bodelan said that several thousand individuals who were gathered outside the building prevented firefighters from getting close to the scene of the fire for quite some time. "The worst thing in this situation was that fire brigades that arrived at the site on time could not begin putting out the fire because the attackers were shooting and resisting,” he said. All of Bodelan’s attempts to increase police presence in the area went unanswered. “I was forced to negotiate with activists, who looked to me as heads of fighter units, that we could work calmly,” he said. 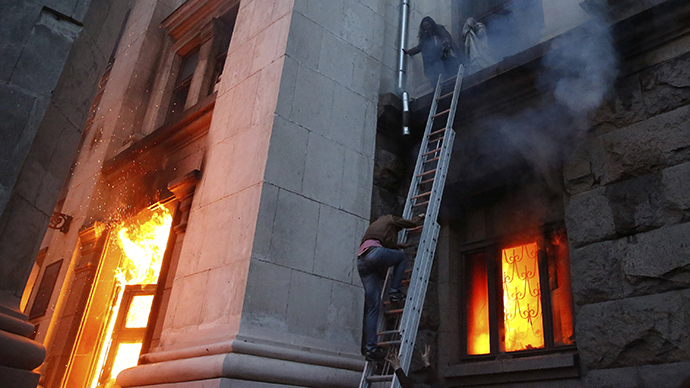 At the same time, Kiev has made public its report, in which it also revealed what caused the death of nearly 50 people. According to “official information,” six people died of gun shots, 32 suffocated or died in the flames and another 10 fell to their deaths. Forty-eight of those killed in the massacre have been identified by both local and social media. Three bodies people are still considered missing, according to various sources. Over 60 people remain in hospitals, 26 of whom are in grave condition. 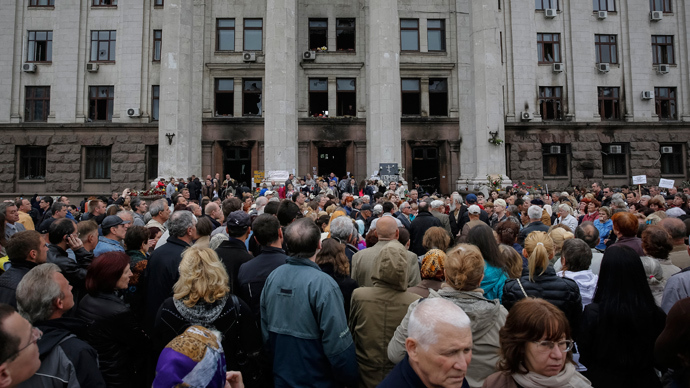 Residents of Odessa gathered last weekend for a memorial service to commemorate the victims of the May 2 bloodshed.